I am very fond of fennel. It has a surprising, slightly anise-like taste that often surprises guests, who don’t expect that in a vegetable. This is a lovely dish, both to look at and to eat. I served it at room temperature at a buffet, but it would be nice warm as a side dish or cold as a first course/salad. If you get very large fennel bulbs, the outer pieces may be tough and you will have to discard them. The original recipe was from Cooking Light. 4 (1-pound) fennel bulbs with stalks, trimmed and stalks removed. 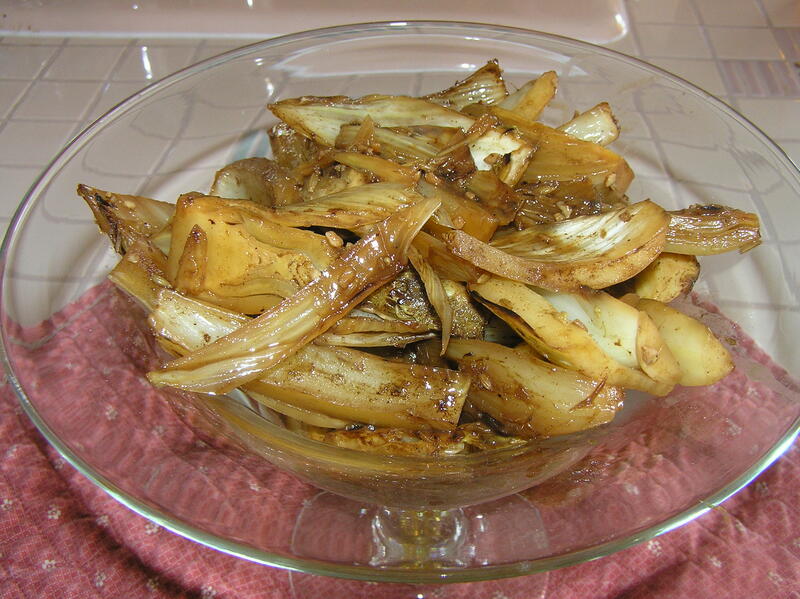 Cut each fennel bulb in half through root end; cut each half into quarters to form 32 total pieces. Chop 1 tablespoon of the fronds; reserve. Heat a large nonstick skillet over medium-high heat. Coat pan with cooking spray. Place 8 fennel pieces in a single layer in pan; sprinkle evenly with 1/2 teaspoon sugar. Cook 3 minutes on each side or until lightly browned. Remove fennel from pan; recoat pan with cooking spray. Repeat procedure with remaining fennel and sugar. Return all of the fennel to the pan. Stir in broth and remaining ingredients; bring to a boil. Reduce heat, and simmer about 35 minutes or until fennel is crisp-tender and liquid is almost evaporated, turning occasionally. (The fennel bulbs will separate into pieces.) Top with reserved fennel fronds. This makes 8 servings at less than 1 gram of fat/serving. It served about 15 people at the buffet (there was lots of other food) and was very good as a leftover for lunch. I have always been fascinated by fennel (the green plant, not the tasty little seeds) – its delicate fronds and licorice perfume – but I never could figure out what to do with it except for slicing a bit of the bulb into a salad, and running around tickling people with the fronds. Then a couple of year ago I saw this recipe in Cooking Light. It had all the characteristics I like in a buffet dish: low fat, make ahead, serve at room temperature, and a bit unusual (have to keep your guests on their toes). These are my basic principles for choosing buffet dishes for a crowd. It is a la grecque, French for in the manner of the Greeks, which basically means that the vegetables are braised in a mixture of herbs, spices, and lemon. It seems fussy, because you need to make it in two batches, but it’s actually a very straightforward recipe. You also make a bag for your herbs and spices, so they are easy to remove from the fennel, a useful technique. Tie coriander seeds, peppercorns, thyme, parsley and bay leaves tightly in a piece of cheesecloth. In a medium-sized mixing bowl, whisk together chicken stock, wine, lemon, juice, tomato paste and 1 cup of water. Heat ½ tablespoon of the oil in a large non-stick pan over medium heat. Add half of the onions and half of the fennel and cook, stirring occasionally, until the vegetables start to change color, about 10 minutes. Pour in ½ of the chicken stock mixture, tuck the spice bag into the vegetables, and bring to a boil. Cook over high heat, stirring occasionally, until the fennel is tender and the sauce has thickened. Season with salt and pepper, and transfer the mixture to a large bowl, reserving the spice bag. Wipe out the skillet, pour in the remaining half tablespoon of oil, and repeat the above steps with the remaining ingredients. Allow to cool, discarding the spice bag. Serve at room temperature garnished with the chopped fennel fronds. This dish can be made up to 2 days ahead and stored, covered, in the refrigerator. Bring to room temperature before serving. Makes 12 servings at 1 gram of fat/serving.